Question: What is the largest American-flagged passenger ship currently in operation on the east coast? Most people would guess that it is one of the luxury liners which grace the Baltimore harbor, so they are surprised to learn it is the John W. Brown – a liberty ship constructed for service during World War II. Liberty ships – those ungainly cargo transports of so many wartime newsreels – were originally designed to have a useful life of about five years. Hundreds survived the war and went on to aid a number of rebuilding nations, while others filled the fleets of entrepreneurs such as Stavros Niarchos and Aristotle Onasis. Today only two of the rugged warriors are still in operation: the Jeremiah O’Brien (based in San Francisco) and Baltimore’s John W. Brown. The Brown was built in Baltimore at the Fairfield shipyard in 1942. Liberty ships were constructed at eighteen different shipyards along the Atlantic, Pacific and Gulf coasts. Fairfield had the greatest output of any shipbuilding operation during the war, employing some 47,000 men and women who worked ‘round the clock to produce an astounding 384 Liberty; 95 Victory; and 30 LST’s. After the war, the Brown was decommissioned and then spent the next 36 years on Manhattan’s East River as the only shipboard maritime high school in the United States. Now a floating museum, the John W. Brown cruises from Baltimore to Annapolis several times a year. 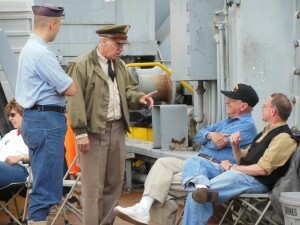 Last weekend the Brown hosted veterans, their families and friends, for the annual Memorial Day cruise. The day included remembrances, a wreath laying, and a thrilling demonstration by five vintage WWII era aircraft. Entertainment was provided by The Manhattan Dolls and by The Ultimate Abbott and Costello Show. Charlestown resident William Fitzpatrick had a plum perch from which to see the lovely Manhattan Dolls. Fitzpatrick served as a Navy Seabee during WWII. Fitzpatrick told the Baltimore Post-Examiner the Seabees were a construction unit conceived by the late Rear Admiral Ben Moreell who foresaw the need of enlisting skilled tradesmen for the quickly expanding war effort. Fitzpatrick said his service as a floater with CBMU – 593 took him to numerous places in the Pacific Theatre, including the construction of the airstrips on Tinian. One of the guys Fitzpatrick met while serving in the Pacific was a Polish emigre named Thaddeus Glendowski. Fitzpatrick said Glendowski was a rock-ribbed man who would go on to be a Navy boxing champion. But he struggled with his English – so much so that he asked Fitzpatrick to compose a love letter to a girl he adored back home. Philadelphia native Howard Dolan, Jr., a board member of the John W. Brown, said he first became interested in the ship after learning about it at the Mid-Atlantic Air Museum’s WWII Weekend. The John W. Brown operates under a unique set of Coast Guard regulations. Though designed for cargo, it is currently used primarily as a passenger ship. All of the licensed seamen (officers, able-bodied seamen) on board have studied and completed the same kind of curriculum Merchant Marines would have taken seventy years ago. The ship must meet modern safety standards whenever passengers are on board, so both Coast Guard inspectors and the crew keep a weather eye out for potential problems. Bill Curtis – one of the volunteers who does have an extensive background (over two decades) as both a Navy and NOAA veteran – has been involved with the Brown for eighteen years. Still, Curtis laughs when he notes, “It’s only been the last 5 or 6 that they’ve allowed me to steer.” Curtis helped to serve as this reporter’s guide while on the bridge of the John W. Brown, then later took me below for an extensive tour of the engine room. 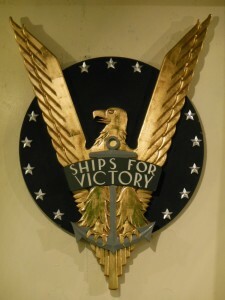 Bauman’s father served on four different Liberty ships during the war. Bauman said he got involved with the Brown before the ship came up from Norfolk in 1988. The ship had been moved to Norfolk from New York after the end of its use as a nautical high school. Volunteers keep the ship ready for field trips and cruises, but the Brown is not only a tourist attraction. Some thirty years after ending its run as a school, the ship continues to educate another generation. The Calhoon MEBA Engineering School in Easton, Maryland, uses the ship to certify some of its students; while Archbishop Curly High School junior Evan Milbourne works with men like Retired Navy Captain Mike Schneider and machinist Duff Porter, helping to maintain and operate the ship’s massive steam engine. Schneider spent 17 years as a submarine commander. 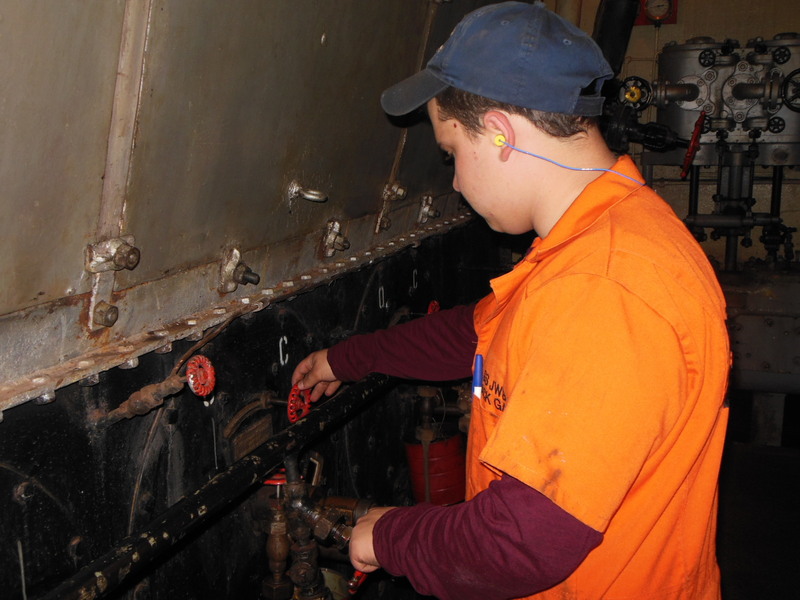 Working last weekend as the fireman/watertender on watch in the engine room, Schneider said he is proud to have a sharp student like Milbourne apprenticing on board. Porter travels from his home in Norfolk to volunteer his time and his talents, but he is not alone in navigating I-95. Some travel from as far south as North Carolina, while others make the trek from Pennsylvania, Connecticut, Vermont and Maine. Then there is the New York connection. A dizzying variety of baseball caps signaled the service of many of the veterans on board. Some simply said Army or Merchant Marines, while others recalled Navy vessels from a bygone era. 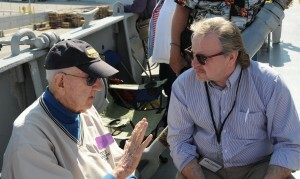 The veterans were happy to share stories about their experiences with anyone who asked. Some spoke of D-Day or the Battle of Wake Island. Others talked of fighting in Vietnam, Afghanistan, and Iraq. Wagner’s service in Korea included participation in MacArthur’s daring landing at Inchon. Wagner also engaged in a spirited conversation about the Korean conflict with a figure familiar to most everyone on board: General Omar Bradley as portrayed by reenactor Jim Callear. Callear also said he has been told by British colleagues that, across the pond, they re-enact WWII with the same degree of dedication so many living historians stateside put into the American Civil War. Seventy-two years after it was first commissioned, the John W. Brown continues to serve a wide range of purposes, from allowing tourists to enjoy a leisurely day on the bay, to providing students of all ages with an opportunity to experience the life of a Merchant Marine. And it serves as an enduring monument to the sacrifices of four generations of Americans. 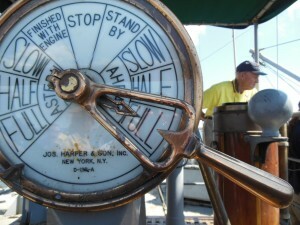 The John W. Brown has three more tours on tap this season: June 14, September 6, and October 4. The ship is also sponsoring a Family Fun event in Fells Point, July 3 – 6. The ship will move to the pier at the foot of Broadway on the 3rd and will be open for tours. Some of the activities that weekend include a movie on the pier; a Variety show featuring the Manhattan Dolls; the Ultimate Abbott & Costello Show; shipboard demonstrations, military vehicles and more. Information about the John W. Brown (including opportunities to serve as a volunteer) may be found by visiting the ship online. ← Do police falsify reports to lower crime rate?